Will Handhelds Replace Laptops? | BlackBerry Blast! BlackBerry Blast! > News > Will Handhelds Replace Laptops? 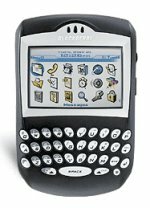 Mike Kanellos of ZDNet has an interesting article about the growing number of companies that are thinking about replacing their field staff's notebook computers with BlackBerry and similar devices. Although handheld sales are still far behind laptops and cell phones, there is a growing trend towards these handheld devices. "Though notebook sales are currently driving the PC market, evidence is beginning to mount that one of the most repeated predictions from the '90s is starting to come true. Smart phones, the BlackBerry and other handheld devices that combine computer applications, Internet connectivity and a phone are starting to displace laptops, at least in the pockets of the corporate world." Why the move to handhelds? Cost is always a concern. Laptops run between $1,000 and $1,500, while handhelds run between $300 to $500. Issuing handheld devices rather than laptops will obviously save a lot of money. Also, because most handheld devices include a cell phone, that's an additional cost savings to consider. One concern could be security. It is a lot easier to lose a handheld than a laptop. With security features of handhelds still lagging behind laptops, companies could expose themselves to a real security threat if precautions are not taken.